AGUILBERTE, the second Abbess of the Abbey of Notre-Dame de Jouarre, in Austrasia. St. Aguilberte reposed circa 680. 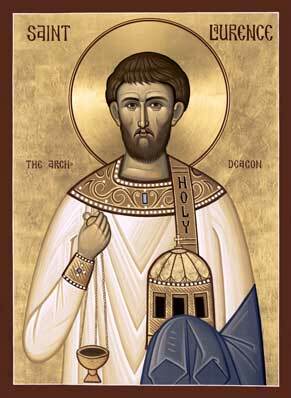 AREDIUS (ARIDIUS, AREGIUS) , Archbishop of Lyons from 603 until his repose 615. He was a highly regarded theologian who actively fought against heterodoxy. ASTERIA (HESTERIA), a martyr (circa 307) venerated since the fourth century, in Bergamo in Lombardy. According to ancient tradition she was beheaded during the Diocletianic Persecution. She is also associated with St. Grata (1st May) in the burial of the holy martyr Alexander (26th August). BASSA, PAULA, and AGATHONICA, (Date Unknown), nothing is known of these three maidens, other than the have been listed in the major martyrologies for generations as martyrs at Carthage in North Africa. BETTELIN (BERTRAM), (Eighth Century), in the Anglican Church of the Holy Cross at Ilam, Staffordshire, is the Chapel of St. Bertram, built in 1618 by the Meverell, Port, and Hurt families. The chapel holds the remains and shrine of St. Bertram, an Anglo-Saxon saint, whose existence is entirely legendary. All the information on St. Bertram, or Bettelin, seems to come from a Life in the 1516 edition of the Nova Legenda Angliæ . St. Bertram is described as a seventh or eighth century Mercian King who renounced his title and wealth, and abandoned the world. He became a hermit in the area that is present-day Stafford, of which he is patron saint. This Life is confused and intertwined with that of St. Bettelin (9th September), and it is possible, if not probable, that they are one and the same person. may find safety and rest in the fold of Christ in paradise. BLANE (BLAAN, BLAIN), (Sixth Century), according to the Aberdeen Breviary St. Blane was a disciple of SS. Comgall (10th May) and Kenneth (11th October). He was consecrated Bishop of Kingarth in the Isle of Bute in Scotland at the end of the sixth or beginning of the seventh century St. Blane was buried at Dunblane, where the Cathedral and several churches are dedicated to his honour. However, there is debate regarding the dates generally given for his life. If, as it is thought, he was a disciple of SS. Comgall and Kenneth then his birth must have been after 550. However, Butler, and Dempster insist that he flourished in the tenth or eleventh century, perhaps confusing St. Kenneth with King Kenneth († circa 1000). The Bollandists reject the theory that St. Blane studied under of SS. Comgall and Kenneth. This leads to the contemporary hypothesis that there were two different St. Blanes, one who lived in the sixth century, and a second who lived in the eleventh century. DEUSDEDIT, (Sixth Century), a poor shoemaker in Rome. According to St. Gregory the Dialogist (3rd September), who was a contemporary, each Saturday, St. Deusdedit gave away to the poor all that he had earned during the week beyond the minimum necessary for basic sustenance. GERONTIUS (GERAINT), (Sixth Century), St. Gerontius was a King of Dumnonia (present-day Devon England) who fell in battle against the pagan Saxons (circa 508). Numerous romantic legends evolved about his life and that of his wife, Enid, all of doubtful veracity. The first known mention of him is in the 12th century Exeter Martyrology , which refers to a King Gerontius, though not as a saint. An Exeter Litany attributed to Bishop Leofric of Exeter (+c. 1072) mentions a St. Gerontius. Another Gerontius, a King of Cornwall who reposed 596, is listed as a saint in some works, though without a feast date, and may be the same person. A modern Bollandist has speculated that the first Gerontius was a local saint who was elevated to the status of king in the writings of later hagiographers. and a wise and pious king, O holy Geraint. for those who call upon thee, that He will save their souls. LAURENCE of ROME, the holy, glorious, and right-victorious Archdeacon and Martyr St. Laurence was an archdeacon of the Church of Rome as well as a companion of Pope Martyr Sixtus II (6th August), both of whom were martyred under persecution by the Emperor Valerian (258). Little is known about St. Laurence’s life. According to legend he was a native of Northern Spain, and possible accompanied Pope Martyr Sixtus to Rome when he was elevated to Bishop of that See. The Basilica of San Lorenzo in Panisperna was built over the place of his martyrdom. you were tried by fire and no evil was found in you. "Nothing can separate me from the love of Christ." MARTYRS of ROME, one hundred and sixty-five Christian soldiers martyred in Rome in the persecutions during the reign of Aurelian 274. 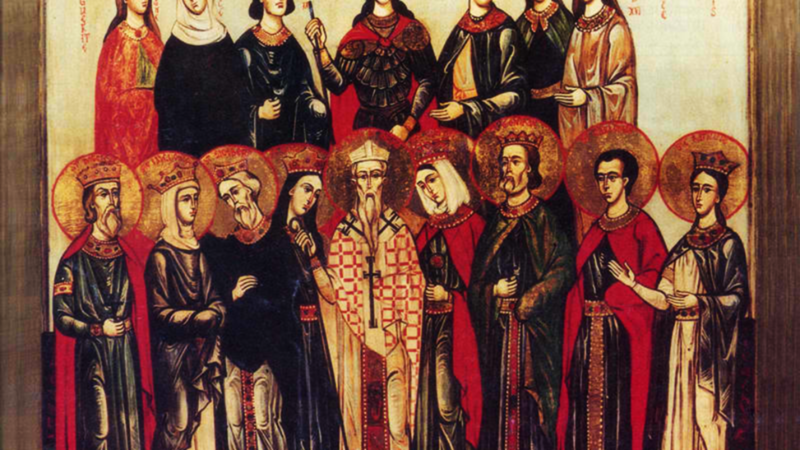 THIENTO (THIENTE) and COMPANIONS, an Abbot of Kloster Wessobrunn near Weilheim in Bavaria, who was martyred, along with six of his monks, by invading Magyars of Hungary, 955.